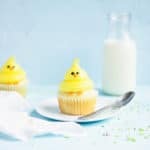 Your Easter festivities are sure to be every bit as sweet as they are bright with these easy chick cupcakes. With a moist vanilla cupcake topped with a rich vanilla buttercream, these cupcakes are sure to appeal to even the pickiest eaters. Stir together the dry ingredients for the cupcakes. Slowly beat in the butter, beating until the mixture has a fine, crumbly texture (about 3 minutes). In a separate bowl, whisk together the sour cream, eggs, oil and vanilla. Whisk into the dry ingredients until just combined. Add the milk, whisking until lump free. Pour the batter into a lined cupcake pan, filling the liners about 2/3 of the way full. Bake at 350F for 14-16 minutes, or until a toothpick inserted in the center comes out clean. While the syrup cooks, whip your egg whites in the bowl of a stand mixer until stiff peaks form. On low, begin adding 1″ slices of the butter until all the butter has been added. Whip the frosting on high until it becomes a thick frosting (it’ll look curdled first, but don’t worry. Just keep on whipping). Turn the mixer down to low, add the vanilla extract and yellow food coloring, and continue whipping until the frosting is completely smooth. In a small bowl, melt your orange candy melts with 1/4 tsp vegetable shortening in the microwave using 10 second increments. Pour the melted candy melts into a piping bag, clip a small opening in the tip and pipe your feet and beaks onto parchment paper. To assemble the cupcakes, spoon your yellow frosting into a piping bag with a large round tip (I used an Ateco 809). Pipe a large dollop onto each cupcake, and then go back and pipe a smaller dollop on top of it. Press two black sprinkles into the front of the smaller dollop of frosting, add a candy melt beak and two of the candy melt feet. Knowing when your cupcakes are done: There are two ways to test for doneness. 1. Insert a tooth pick in the center of the cupcakes and if it comes out clean, it’s done. 2. Gently press the top of the cupcake and if it almost immediately springs back, it’s done. If you’re making the frosting in this recipe, don’t be discouraged if it looks curdled after you add the butter. The butter and meringue will separate slightly before coming back together. Just keep whipping the frosting. The secret to smooth, air-bubble free frosting: Once the frosting has come together, turn your stand mixer down to low and continue whipping it for about 5 minutes. This should work out most of the air bubbles.